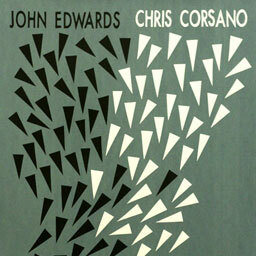 Chris Corsano, drums, percussion; John Edwards, double bass. This is a vinyl-only release, the first two tracks on side 1 and the last two on side 2. Limited to 500 copies. The first 100 copies came with a specially-produced and limited 3" CDR with additional tracks from the same session. Recorded December 2008 at Eastcote Studios, London. Great liner notes by Evan Parker. Artwork (front cover reproduced above) by Midori Ogata. More information from Dancing Wayang Records.